Why does a line outside a store always grab our attention? Does it arouse curiosity, excitement, a sense of mystery? What could be so popular, scarce, or valuable that it provokes shoppers to brave the elements and surrender their time? The daily line outside Casa Hernanz every summer made me wonder just that. Although the colorful window display hinted at shoes, I wasn’t sure how to translate the words Cordelería – Alpargatería. Normally, I would have joined the line and found out for myself, but the store’s tiny interior meant there was nowhere to hide should you be “only looking”, and the risk of being knee-capped by the impatient mob behind me was too great. Instead, I asked an elderly woman what the fuss was about. “Las mejoras alpargatas de Madrid!” she said, with a raised hand as if to slap me. Whatever alpargatas were, here were the best in the city according to my friend. Not being a fashionista, I was only vaguely familiar with espadrilles. So I did some research. Espadrilles very likely descended from the ancient Egyptian sandal, but the first European records of such a shoe date from the 14th century. Although “espadrille” is French, those first records were in Catalan, one of the languages of the mighty Crown of Aragon, whose port city Barcelona dominated Mediterranean trade. In Catalan, these sandals are called espardenyas, due to their principal material espart, a common Mediterranean grass. French dialect on the other side of the Pyrenees would eventually transform this word into espadrille. So if espadrilles are called espardenyas in Catalan, why are they called alpargatas in Castilian? Unlike central and southern Spain, Catalonia did not experience extensive Moorish rule. As a result, the Arabic influence on Catalan is less apparent than on Castilian Spanish. Of the 88,000 words recognized by the Royal Academy of Spanish, roughly 4,000 have Arabic origins. Obvious examples start with the Arabic article, “al” – álgebra, alquimia, algoritmo, and our superstar sandal, alpargata. In summary, espadrille = espardenya = alpargata. Got it? 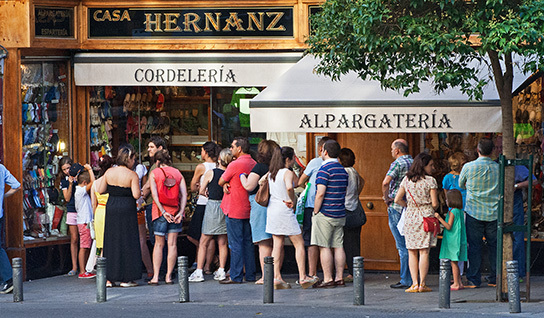 Casa Hernanz has been selling espadrilles and rope-related items (i.e. cordelería) at the same address for over 150 years. It was Toribio Hernanz, the great-grandfather of the current owners – brothers Jesús and Antonio – who opened the store back in 1845. The uncomplicated espadrille owes it success to two things: it’s affordable and functional. Materials include cotton and linen for the canvas tops, while esparto grass, jute rope or even braided hemp have been used for the soles. Occasionally a rubber lining is added to the sole for more durability. But the array of choices is relatively new. Jesús Hernanz (seen below) recalls how little variation there was when he and his brother took over the store: just four colors and three styles in total. They were lucky to offer even that, given the shoe’s declining prospects in post Civil War Spain. As Spaniards traded agriculture for factory work in cities like Barcelona and Madrid, sales of espadrilles dwindled. What reversed the shoe’s fortunes? The interest of Yves Saint Laurent. In 1970, Isabel Sauras, one half of the famous Castañer espadrille brand, met Saint Laurent at a trade fair in Paris. According to the New York Times, she and her husband produced a model with “gold satin ribbons, red satin uppers and gold thread mixed with jute coils,” following a request by the famous designer, who then featured them in his show. The espadrille has never looked back. While Saint Laurent may have given the espadrille industry an international boost, you won’t find any YSL/Armani/Dior-inspired designs at Casa Hernanz. Nor will you find their eye-watering prices. Casa Hernanz offers a few modern examples to appeal to fashionistas, but the store’s fame rests on having perfected the everyman’s espadrille de toda la vida. Their most popular model – the flat-soled alpargata offered in some fifty colors – sells for under 6€. Yes, this is a tremendous bargain, given that the sandals are produced using the same proven materials and methods since 1845. Hence the lines. However, should you not fancy waiting under the blazing sun for the best espadrilles in Madrid, come first thing on a weekday morning and you’ll have the store practically to yourself. What about you? Own a pair of Spanish espadrilles? Where did you get yours? If you enjoyed this post, sign up here to receive email updates in the future! Casa Hernanz – calle Toledo 18. Open Monday – Friday, from 9am til 1:30pm, 4:30pm-8pm, and Saturdays from 10am til 2pm. Metros Sol (Lines #1,2 3), Tirso de Molina (Line #1), or La Latina (Line #5). I was sent a link to this site from a Rick Steve’s’ Travel Forum on Madrid. I was so glad I clicked on it. It is a very informative blog. I can’t wait to visit some of these shops and maybe take some of the wine tasting tours during our time in Madrid. Loved the shoes I purchased awhile I was there. Can you purchase them online? These things are sooo useful that I have adapted a pair for my whippet who has suffered with corns for ever. Can’t wait to get back to Madrid and get some for Lili, she will love them as well. I’m traveling to Madrid in October and am so happy to come upon your blog! The places you write about are just the kind of places I love. I’m already making room in my suitcase for these espadrilles! I’m so happy to hear that. I know you’ll love Madrid! Thanks again for the kind words about the blog and enjoy your trip! We will be in Madrid in 2 weeks (yeah! ), and your articles have been most helpful in planning our trip. We will most certainly be taking your recommendations to make the most of our time there. Many thanks for such a wonderful variety of topics! P.S. Followed Rick Steves’ recent blog while he was in Spain and saw you in his videos. You obviously are very passionate about Madrid. Thanks so much for the kind words about my posts, I’m thrilled you’ve found them useful for your upcoming trip! Glad you saw the posts with Rick as well, it was a lot of fun having him in Madrid. All the best and enjoy your trip to our wonderful city! I would love to be the reseller here in Malaysia. Its always summer in here. 😀 Think we can make a good business deal.